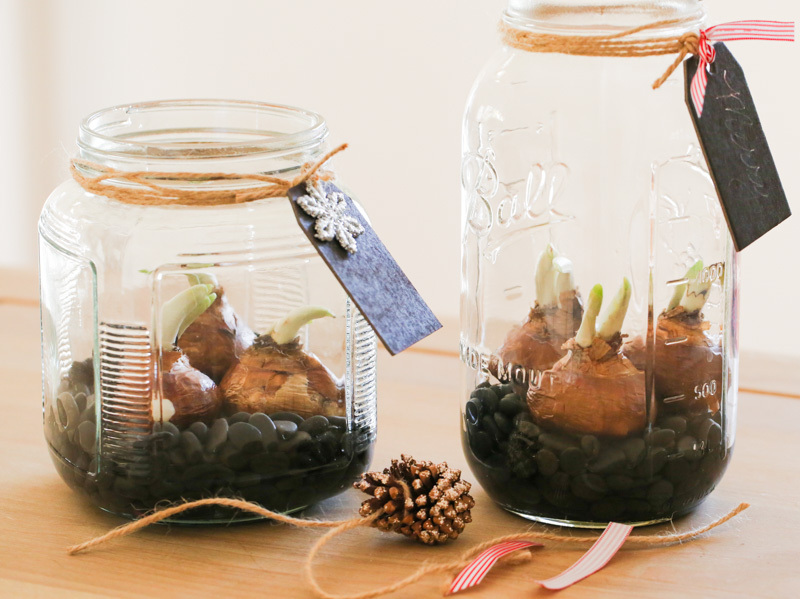 One of my favorite things about the holiday season is growing bulbs indoors. I do this for both Christmas and Easter. There is something about growing flowers indoors during the chilly winter months. During Christmastime, I especially love growing paperwhites. This is a fail-proof project for even those with a brown thumb. If you have grown paper whites in the past, I can bet that one of your biggest pet peeves and mine too is that when they grow tall they often flop over from gravity. Sure, there are ways to add things to the water to stunt their growth, but why harm the bulb? This year, I wanted to show you a simple and easy way to grow paperwhites without them falling over. I love to give these as gifts. They are simple and stunning and I’m going to show you how to make them!